(NATURALSOCIETY) A study from Microsoft involving more than 2,000 people has found that the average attention span has dipped to a low 8 seconds – down from 12 seconds in 2000. A goldfish has an attention span of 9 seconds. There are many effects from smartphones and the like on the human body which are never written about. Information technology (IT) is much more powerful in unrecognized ways than is generally acknowledged. Because these various IT devices are often very close to a person’s body, they can and do have profound effects on the human bioelectric field. The key factor in this ever-intensifying dynamic between human and technology is the length of time of daily interaction. In other words, picking up a cellphone to make a couple of calls a day is one thing; being tied to your smartphone 24 hour a day, 7 days a week is something altogether different. Herein lies one of the key causes of the shrinking attention span. Additionally, constant exposure to cell phones near our heads may be dangerous. Attention span is connected directly to the presence of mind necessary to sincerely engage in person-to-person interaction. How often do the younger generations eschew the focus of personal interaction for the sake of not missing the internet happening of the day? Things are now moving so quickly that many within the younger generations do not want to miss out on anything. Consequently, their attention spans are being shortened to accommodate that next “BIG” event which can only be experienced on the internet or by way of the smartphone. Just how seriously is this trend moving in the wrong direction? “Our attention spans aren’t just down as a whole — we’re having trouble focusing in general. Forty-four percent of study participants said they have to concentrate really hard to stay focused on tasks, and 37 percent said they’re not able to make the best use of their time, which forces them to work late or on weekends. If those numbers aren’t alarming, it is what the future holds in store for those who come after these groups which may prove to have broadly negative societal ramifications. First, living in American society has never been so complex and challenging on many levels. Something as simple as driving in city traffic has now become a major chore; not because there are more cars and trucks on the roads; rather, because of what people are doing in their vehicles when they should only be driving. What’s the real point here? Safety! It is becoming more and more dangerous to drive down the street when the other driver is still putting on her makeup while drinking her coffee and pecking out a text message that was unnecessary in the first place. In the man’s case, he’s tying his tie or cutting his mustache. In any case, the attention is not being placed on that which requires it the most. Particularly when individuals sleep with their smartphones is this societal challenge becoming a potentially serious problem. Answering calls and text messages throughout the night only further disrupts necessary sleep. Making this a habit will ultimately cause sleep deprivation which will inevitably translate to accidents and poor work performance. (Loss of sleep also ages the brain.) 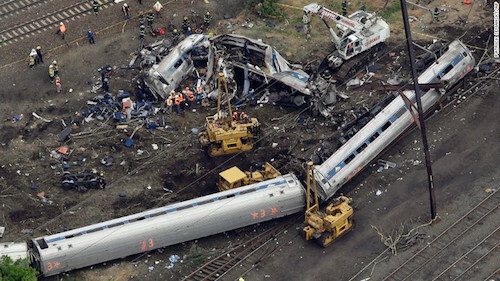 That may not sound like a big deal if you work in a safe office environment; however, what happens if you’re an Amtrak engineer? The incidence of both ADD (Attention Deficit Disorder) and ADHD (Attention Deficit Hyperactivity Disorder) have been rising rapidly over the past couple of decades, just as Autism and Asperger’s syndrome have seen a marked increase over the same time period. There are several co-factors for this, of which information technology is a primary one. With each passing year, changes in society have been placing greater demands on the teenagers and young children to perform as adults. This pressure to keep up with everyone else is placing inordinate pressures on young people, some of whom are simply unable to cope. Effective stress management, or lack thereof, has always been a major contributor to the ability or inability to focus. This in turn affects our attention span. Unavoidably, attention spans will continue to shorten as long as information technology is allowed to intrude on our lives 24/7. This article (Average Attention Span Now 8 Seconds – Lower than a Goldfish) originally appeared on Natural Society and was used with permission. Tune in! The Anti-Media radio show airs Monday through Friday @ 11pm Eastern/8pm Pacific. Help us fix our typos: edits@theantimedia.org.